Although ear wax exists to protect your ears from water and irritants, it can build up and require removal methods. Most drugstores sell ear wax kits for just this situation. These kits are generally safe for home use, but follow up with your doctor or audiologist if you wear a hearing aid or if the kit fails to remove all of the wax. Dampen a clean washcloth with warm water and gently clean the outside of your ear. 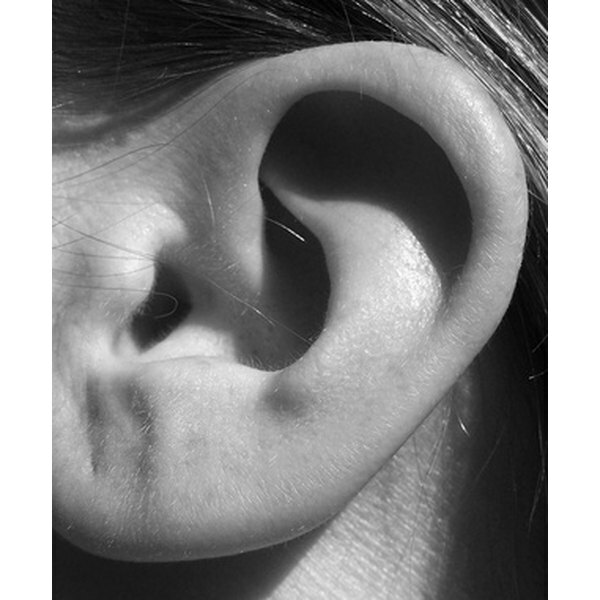 Do not try to clean the inside of your ear with the washcloth or you might push the wax farther in. Follow package directions for filling the syringe or squeeze bulb with the cleaning solution. Tilt your head sideways so that the affected ear is facing up and have a helper apply the ear drops, making certain not to insert the dropper into your ear. If you are administering the drops, have your subject rest his head on a clean, folded towel to help keep it still. Apply the ear drops according to the manufacturer’s recommendations, and let them sit for two to five minutes. Press a clean cotton ball to the ear and sit up. Allow the solution to remain in the ear for 10 to 15 minutes or overnight, according to the instructions. Flush out the wax with the second solution, if your kit contains one. Squirt the solution -- which may be saline, plain water or hydrogen peroxide -- very gently into the ear. Repeat every day for two to three days until all of the wax has been removed. Sleep on a folded towel with the affected ear facing down to help the loosened wax drain out during the night. Never try to dig the wax out with anything sharp or you can damage your ear.